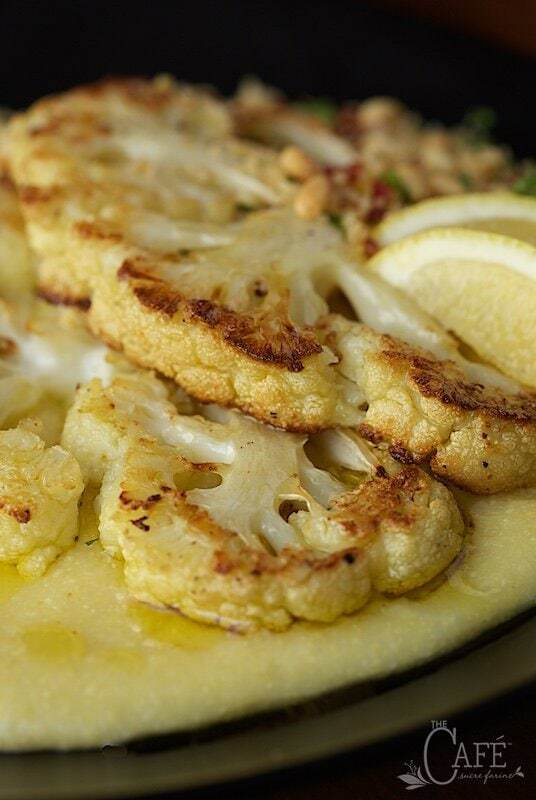 These delicious cauliflower steaks are so good you won’t even miss the meat! “What’s for dinner?”, my husband, Scott asked late one afternoon. It was about a year ago, but I remember the discussion like it was yesterday. Well to be honest, it wasn’t much of a discussion. “Cauliflower steaks”. I looked up to see his response. “Hmmm…” It was a polite “hmmm…” but, after 40 years of marriage, I could hear the dubiousness (is that a word?) in his voice. It definitely wasn’t the response I would have gotten, if I’d said “Steak and Potato Arugula Salad” or “Sugar Seared Salmon” or “Pork Tenderloin and Cashew Stir Fry” or”Italian Meatballs and Marinara” or a zillion other things I make. I know this man. After all these years, we think each other’s thoughts, read each other’s mind, anticipate each other’s needs, laugh at each other’s dumb jokes, wipe away each other’s tears and call each other out when necessary (I need that more than he does). Yes, I knew right away, he wasn’t thrilled with the idea of “cauliflower steaks”. Until he took the first couple of bites. Like I said, that was a year ago and somehow, time just slipped away. Winter came and went, and before I knew it, I was into asparagus, strawberries and fresh corn. I have so many ideas sometimes, most of the time, (ALWAYS, editor’s note – sorry dear! ), regarding what I want to share on the blog and many things just never make it. 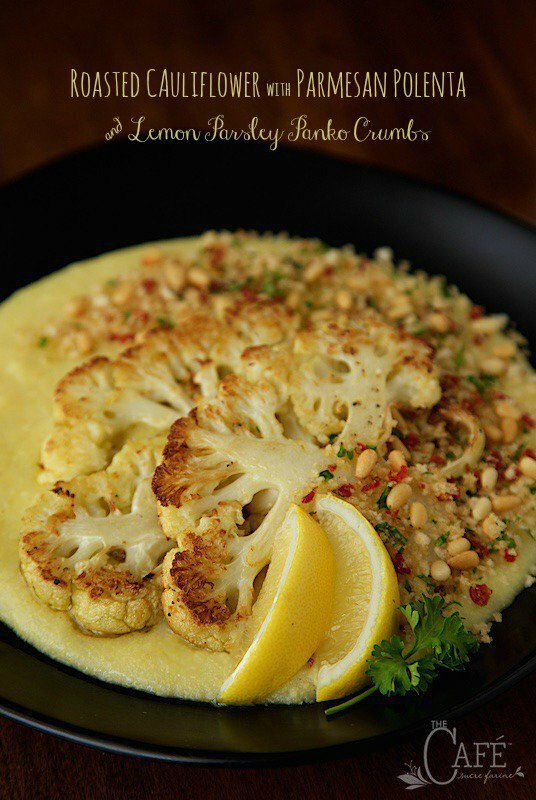 So, when I saw a big display of beautiful cauliflower at the market recently, I decided I would not let another winter season pass, without sharing this wonderful recipe. The method for preparing the cauliflower is a bit unusual, as it’s sliced into thick slabs (steaks), instead of breaking it into florets. Once the slicing’s done, the recipe comes together quickly. The “steaks” are placed on a sheet pan, drizzled with olive oil and roasted in a piping hot oven. That’s where the delicious magic occurs, transforming anemic white slabs into golden, caramelized works of art (it pulls the natural sugar to the surface of the cauliflower). I love that you can have this beautiful, healthy and very gourmet meal on the table in less than 45 minutes. Now that’s my kind of dinner! There’s a simple topping comprised of melted butter (only 2 teaspoons! ), panko crumbs*, parmesan cheese, lemon zest and parsley. It’s sprinkled on just before serving, along with a handful of pine nuts**. It’s delicious and makes for a pretty presentation. If you have lots of time, you can make the polenta from scratch, but I’m usually scurrying to get dinner on the table, so I like to use the instant polenta. I have a little trick that takes just a few minutes extra, but it takes the polenta up a notch, and you won’t even know it’s not from scratch. I just add extra liquid (in this case chicken broth) and cook it a few minutes longer than called for. The polenta comes out sweet, fluffy and super yummy. Of course, a handful of grated Parmesan cheese, doesn’t hurt a bit! This would make a fun, unique and delicious entree for a dinner party. It’s hearty and healthy, but not heavy. It’s also easy enough to make for a weeknight dinner and is a great way to pack some great nutrition into your diet. Did you know that cauliflower is listed as one of the top 20 ANDI score (Aggregate Nutrient Density Index) foods? ANDI measures vitamin, mineral and phytonutrient content in relation to caloric content. To earn high rank, a food must provide a high amount of nutrients for a small amount of calories; pretty cool, huh? Oh, and if you have a meat lover in the family, surprise him or her with this Roasted Cauliflower with Parmesan Polenta. They might not look at it as a wonderful surprise at first. They might even say “Hmmm…” when you tell them what’s for dinner. P.S. Thanks so much for filling out the Reader’s Survey 2016. We’ve been overwhelmed with your kind and encouraging response and are taking all suggestions to heart. Scott and I really appreciate your input and will share some of the results over the next few weeks once the Survey is closed. A gourmet, meatless meal that will blow your mind! It's hearty yet healthy and delicious! Adjust oven rack to middle position and preheat oven to 450°F. Drizzle a sheet pan with 1 tablespoons of olive oil. Set aside. Remove any outer leaves from the cauliflower, but leave the stem intact. Place head stalk side down on a cutting board. Using a large chef's knife, slice cauliflower lengthwise into 3/4" slices. Some of the slices will crumble a bit into smaller pieces. That's okay. The center slices should remain pretty intact. 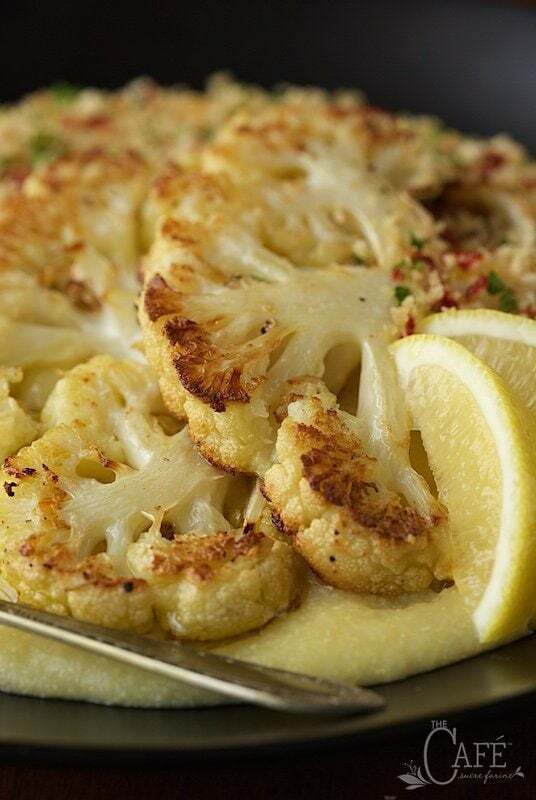 Arrange cauliflower slices and any stray pieces in a single layer on prepared baking sheet, placing any stray pieces in the center of the pan. Drizzle with remaining oil and season with salt and pepper. Don't worry, at this point it will seem like you have way too much cauliflower but you'll be surprised at how much it shrinks during the roasting process. Roast until underside is deep golden brown, 15–25 minutes (start checking after 15 minutes). Turn cauliflower over, season with salt and pepper, and continue to roast until other side is deep golden brown and crisp, 15–20 minutes longer. While the cauliflower steaks are roasting, make the polenta. Bring broth to a boil in a medium large, tall pot. (When the polenta starts cooking it tends to bubble and splash so a tall pot keeps it from making a mess, but even more important, from burning you.) While the broth boils, slowly add polenta, stirring or whisking continuously to prevent lumps. Once all polenta has been incorporated, lower eat to a gentle simmer and cook, uncovered for 6-8 minutes. Add parmesan and salt and stir to incorporate. Polenta should be thick but spoonable. If it gets too thick, you can add a bit more chicken broth, to thin. To serve, spoon polenta into four shallow bowls. Arrange cauliflower steaks on top and sprinkle with panko mixture. Garnish with parsley and lemon slices. Enjoy! * Panko crumbs are Japanese bread crumbs. They're different than normal bread crumbs you might make or buy because they have sharp, angular edges and they stay super crisp and crunchy. You can buy panko crumbs at most larger grocers. You'll generally find them in the Asian section. You can also find them online. ** Pine nuts are ridiculously expensive but you only need a few for this recipe and they add a delicious, gourmet touch. I like to buy them at Trader Joes. They're decently priced there at 6.99 for an 8-ounce bag which is about as cheap as I've found. I store them in the freezer and they last a long time as I use them with discretion. You can also buy pine nuts in bulk at Whole Foods, definitely more expensive but you can purchase as few or many as you need. where would I find the polenta. I have lost 84 lbs and would like to loose more. I am 75 and trying to get into better shape so that I can do better for myself and for the Lord.. Ifwhen I get the time I will look at the site in more detail to get ideas on what I can come up with to eat better. Thank you in advance. Jim, Scott and I applaud your excellent choices! Polenta is usually found in the the Italian section of your grocery store. Sometimes it’s not labeled as polenta, but medium or coarse ground corn meal is basically the same thing. Made this for my husband and I a few night ago, it was excellent. Love roasting vegetables, making cauliflower steaks was a great idea, they were delicious! The polenta was also wonderful, putting the two together was just fantastic and healthy too! Thank you Chris, for another great recipe, I make so many of your dishes and love your blog and Scott’s beautiful pictures!!! Thanks Gail for such a sweet comment, this is one of our favorites too! Hi Marcelle! This would be perfect for your friend! You’re so welcome Marcelle! Thanks for stopping by The Cafe! Hi Penny, you could use a little fresh thyme and it would be delicious! I wouldn’t have thought of it but cauliflower and polenta are a great pairing. Hello Chris, I à french and I often come hère to pick some ideas on your blog. The receipes are simple but always look delicious. And they are. I love roasted cauliflower. I’ll try the combination cauliflower/polenta/parmesan for thé tomorrow lunch. Thanks for thé original receipes and beautiful photos. You’re so welcome Ariane! And welcome to the Café! Come back often! I love you for this recipe, it is one of those I know I will not forget to make, it is already on the list, I only have to get the cauliflower. As a born and raised Romanian I do eat polenta very frequently, but never had it in this combination, it sounds absolutely perfect! You are so sweet Adina! I think you and your family will enjoy it! Hmmmm. NO, just kidding! I love cauliflower and made cauliflower steaks when I first saw the idea a couple of years ago. I love how you plated it on polenta with the pine nuts. and Parmesan. I would definitely have this for dinner any day. It’s always intrigued me too Susan, and I’m glad I tried it. 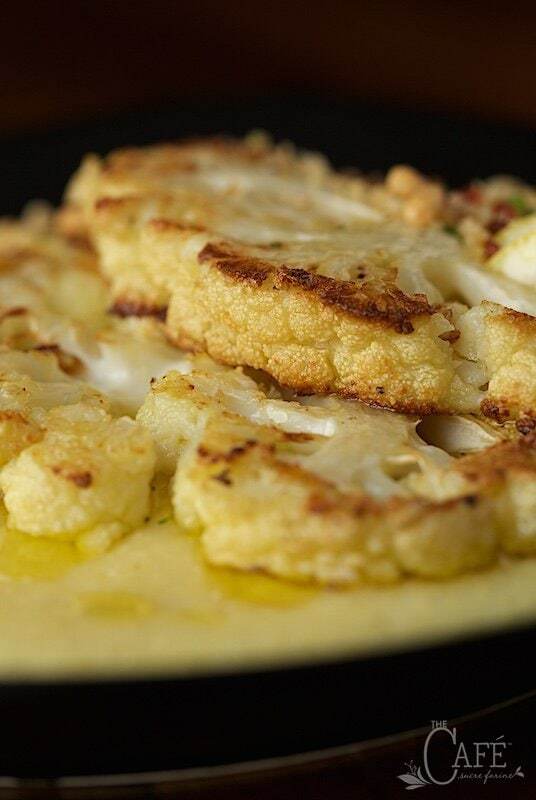 Roasting brings out such a delicious flavor out of cauliflower, and Parmesan is such a great idea to the polenta! Looks delicious! Thanks Melanie! It’s fun to watch get golden in the oven when you roast it! Oh I know that husband tone of voice veeeeery well — this looks so delicious, I could eat this every night for a week! I really is a keeper Sue! And cauliflower is such a super food from a health perspective! Chris, my kids are of the age where cauliflower returns wrinkled noses―that was the response last time I served some. But this preparation elevates the vegetable. Considerably. Pinned for a future meal! Thanks Jennifer! Scott’s a good sport, since we rarely have the same thing again after I’ve figured out how to make a recipe. I might make it 3 or four times, and then it’s gone! He never knows what to expect! This is a keeper Chris! I’ve always wanted to make cauliflower steaks and I love the way your served them with the polenta. If you called me to dinner for this I would be ecstatic! Happy weekend! Thanks Tricia! The polenta creates such a nice bed to serve them in and the cheese adds another layer of flavor! This sounds delicious Chris and after the holidays I will be glad to have a meatless meal during the week. We couldn’t agree more, Madonna! How did you come up with so many wonderful ideas and recipes? This looks beyond delicious! I wish I knew Angie! I guess my brain is just wired for cooking and food! Great post. I love cauliflower. In fact I made a cauliflower gratin to share on Christmas Eve and everyone loved it. No leftovers. That’s a win. I have seen recipes for Cauliflower steak but none have interested me. I like your version, especially with the added polenta. Nice post. I’ll give this a try. Thanks Mary, we really enjoyed it, even the doubters! Ha! Inspired combination! I love both separately but wouldn’t have combined them without your blog. I’m going to use chopped pistachios instead of pine nuts; much easier for me to find. Thank you. Thanks Helen! It’s fun to switch things up a bit, isn’t it? We never have cauliflower, I’m not exactly sure why but I’m certain it’s my fault. I guess I’ve never been too much a fan of it. It’s always tasted a bit bland to me. However, this doesn’t sound bland at all and looks very tasty. I’ll definitely be sure to give it a try. When I was a kid, I think the standard cooking method was overcooking it Vicki, so it took some time for us to realize what a delight it is! Hi Chris. 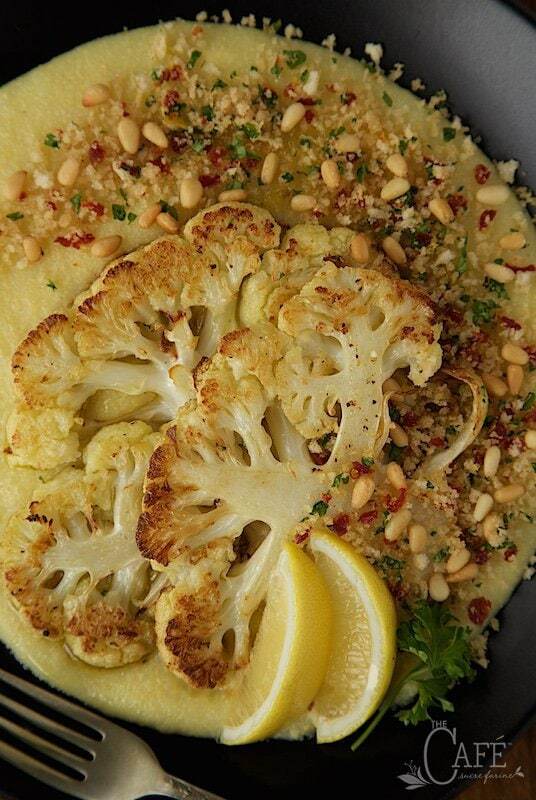 I could eat this all day long, I love cauliflower, Perfect way to serve it! Then you’ll love this recipe Cheri! We watched a PBS show called “How Does It Grow?” this past week on cauliflower. What an amazing vegetable! I would eat this dish any time, Chris! I am such a fan of polenta that I can eat it by itself. But I will have to try the cauliflower steaks. They really sound interesting and great for my current diet. I have decreased my meat consumption significantly. Scott says he doesn’t miss the meat at all in this recipe, and the guy loves his meat! We’re very careful about portion size around here though, and that can make such a difference. 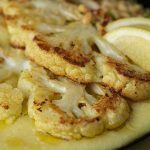 I love roasted cauliflower, and when we had cauliflower steaks earlier this year, I got pretty much the same unenthusiastic response…until I mentioned the beer cheese sauce 🙂 I can’t wait to try your version with polenta, Parm and pine nuts! Jenna, you’re version sounds wonderful too! I think you’ll love this version. I love cauliflower steaks and pairing them with creamy polenta is a brilliant idea! It’s such a nice combination Laura! And the cauliflower … oh my!